The Samsung Galaxy Note 3 phone features a unique multitasking tool called Multi Window: this feature allows you to view two apps at a time. Before you can use Multi Window, ensure that it’s activated: Pull down the notifications panel and choose the Multi Window Quick Action. (You may have to scroll the Quick Actions left or right to find that button.) After it’s activated, you see the Multi Window tab on the left side of the Home screen,. To use Multi Window, touch the tab. You see the various apps sitting in the Multi Window tray. Drag an app icon from the tray out onto the screen to start that app. To start a second app, drag another icon from the tray onto the screen. With Multi Window active, the Home screen is split horizontally or vertically, depending on the phone’s orientation. Each side of the split contains a running app, which illustrates the my Music and Gallery apps. To adjust the window size, drag the separator left, right, up, or down, depending on the phone’s orientation. The two windows need not be equal in size. Tap the separator’s button to view the window controls. 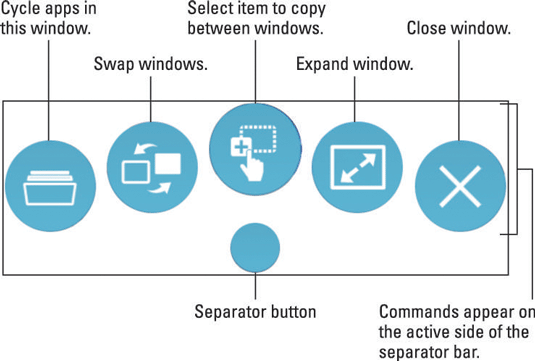 Use the controls to manage the windows and enjoy various Multi Window features. To exit Multi Window, close one window; or expand a window until it’s full-screen size. You can also exit Multi Window mode by pressing the Home button. 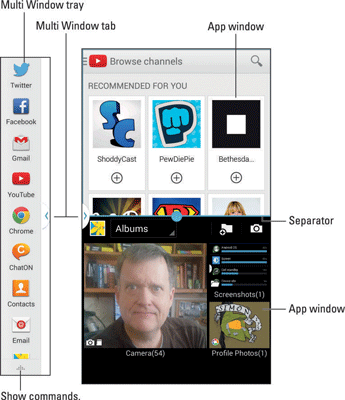 Only certain apps can run in Multi Window. The variety is seen by scrolling the Multi Window tray up and down. Touch the Edit button at the bottom of the Multi Window tray to add or remove apps. You can keep Multi Window active yet hide the tab by long-pressing the Back button. To make the tab reappear, long-press the Back button again. If you prefer the Multi Window tab on the right side of the screen, drag it there by long-pressing your finger on the touchscreen. Your phone always runs multiple apps at one time. The only benefit to Multi Window is that you can view two apps at the same time.